Panacur® Equine Dewormer Paste (fenbendazole) is for horses, foals and ponies only. It's safe for pregnant mares and very young foals. Panacur is highly effective against the predominant internal parasites of horses: large strongyles, small strongyles, pinworms and ascarids. It's conveniently administerd and features a unique apple-cinnamon flavor that horses readily accept. Get some for your horse today. 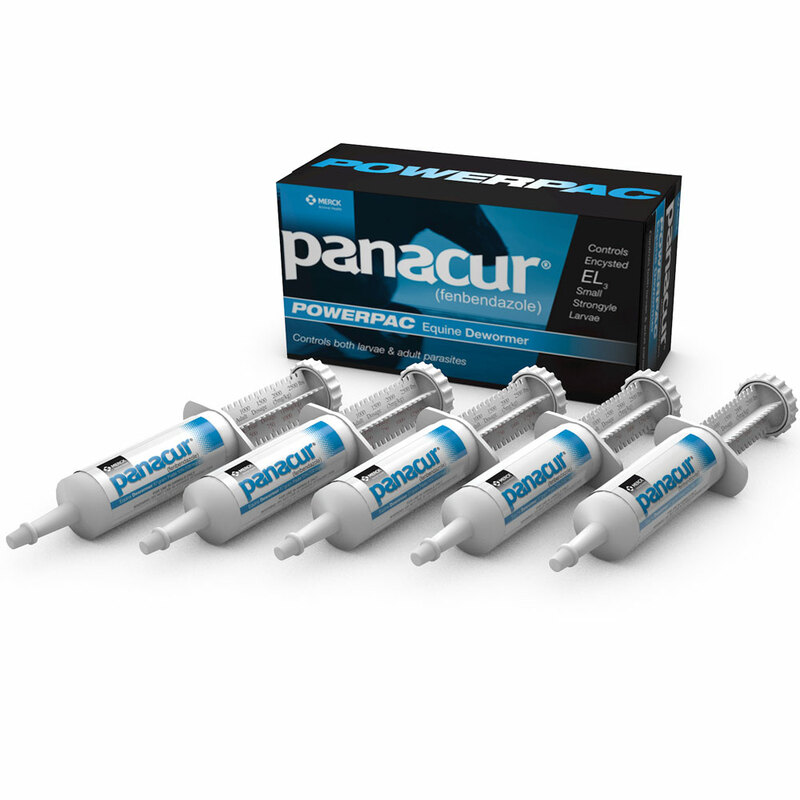 Dosage: Panacur Paste is administered orally at a rate of 2.3mg/lb for the control of large strongyles, small strongyles and pinworms. One oral syringe will deworm a 1,100 lb horse. For foals and weanlings (less than 18 months of age) where ascarids are a common problem, the recommended dose is 4.6mg/lb and one oral syringe will deworm a 550 lbs horse. For control of encysted early third stage, late third stage and fourth stage cyathastome larvae, and fourth stage larvae of S. vulgaris, the recommended dose is 4.6mg/lb for 5 consecutive days using one oral syringe for each 550 lbs of body weight per day. 3. Turn the dial ring until the edge of the ring nearest the tip lines up with the zero. Panacur® (fenbendazole) Paste 10% is indicated for the control of large strongyles (Strongylus edentatus, S. equinus, S. vulgaris), encysted early third stage (hypobiotic), late third stage and fourth stage cyathostome larvae, small strongyles, pinworms (Oxyuris equi), ascarids (Parascaris equorum), and arteritis caused by fourth stage larvae of Strongylus vulgaris in horses. Panacur® (fenbendazole) Paste 10% is approved for use concomitantly with an approved form of trichlorfon. Trichlorfon is approved for the treatment of stomach bots (Gasterophilus spp.) in horses. Refer to the manufacturer's label for direction for use and cautions for trichlorfon. Side effects associated with Panacur® (fenbendazole) Paste 10% could not be established in well-controlled safety studies in horses with single doses as high as 454 mg/lb (1,000 mg/kg) and 15 consecutive daily doses of 22.7 mg/lb (50 mg/kg). Particularly with higher doses, the lethal action of fenbendazole may cause the release of antigens by the dying parasites. This phenomenon mar result in either a local or systemic hypersensitive reaction. As with any drug, these reactions should be treated symptomatically. Panacur® (fenbendazole) Paste 10% has been evaluated for safety in pregnant mares during all stages of gestation with doses as high as 11.4 mg/lb (25 mg/kg) and in stallions with doses as high as 11.4 mg/lb (25 mg/kg). No adverse effects on reproductivity were detected. The recommended dose for control of 4th stage larvae of Strongylus vulgaris, 4.6 mg/lb (10 mg/kg) daily for 5 consecutive days, has not been evaluated for safety in stallions or pregnant mares. Regular deworming at intervals of six to eight weeks may be required due to the possibility of reinfection. In the case of 4th stage larvae of Strongylus vulgaris, treatment and retreatment should be based on the life cycle and the epidemiology. Treatment should be intiated in the spring and repeated in the fall after a six month interval. Optimum Deworming Program for control of S. vulgaris Optimum reduction od S. vulgaris infections is achieved by reducing the infectivity of the pastures. When horses are running on pasture, in temperate North America, maximum pasture infectivity occurs in October-December. If Horses are removed from those pastures in January, pastures infectivity will decline to zero by July 1. Egg production of S. vulgaris is minimal from January through April peaking in August and declining to minimal values in December.